SC student volunteers Ashley and Joshua Michalenko. 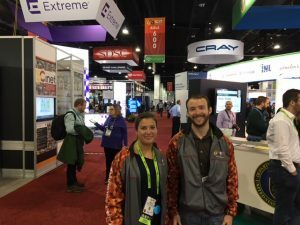 Ashley and Joshua Michalenko certainly appreciate the SC17 theme of “HPC Connects.” The sister and brother attended the conference as Student Volunteers and enjoying the opportunity to spend a week hanging out together. Ashley, 27, is working on her master’s degree in computer science at New Mexico State University (NMSU) in the Michalenko’s home town of Las Cruces. Joshua, 24, is earning his Ph.D. in electrical engineering at Rice University in Houston. Both are studying machine learning. Ashley is in her fifth year as an SC Student Volunteer, providing support during tech program sessions and helping ensure the programs run smoothly. This year, she persuaded Joshua to apply and he was able to join her. Just to make sure they spend enough time together, they’re sharing a hotel room in Denver, as do all Student Volunteers. Ashley points out that it’s usually her who makes the call and since they are both in the same field, they can talk to each other when they encounter problems and brainstorm about solutions. Both said the field was sort of predetermined as both their father and an uncle are electrical engineers. The two don’t even get to spend summers together, since Ashley interns at Los Alamos National Lab in northern New Mexico and Joshua has worked the past two summers at Sandia National Labs in Albuquerque. The last time they spent a few days together was in July when they ran the San Francisco half-marathon (Joshua had the better time). “With this full week together, we get to enjoy each other’s company and the conference,” Joshua said.